In writing about the media, Noam Chomsky has argued that “citizens of the democratic countries should undertake a course of intellectual self-defence to protect themselves form manipulation and control.” British Marxist John Molyneux, who acknowledges his indebtedness to Chomsky, takes up this challenge in his short, lucid, and accessibly written primer on the institutional class bias of the modern media, Will the Revolution Be Televised? 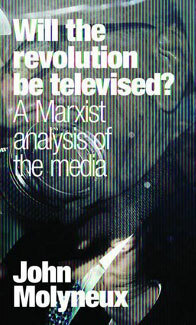 : A Marxist Analysis of the Media (Bookmarks Publications, 2011). Why a Marxist – why any ordinary worker, for that matter – should need a book about the media can be illustrated by a hair-brained motion recently passed by my union, the Ontario Secondary School Teachers Federation, committing half a million dollars to a public relations campaign to combat government attacks on our pensions and collective bargaining rights. A half a million dollars is a fortune for us, but it’s a mere drop in the bucket compared to the unlimited resources of the corporate interests driving the global austerity agenda that has made its way to Ontario. The motion reeks of desperation. Yet the perception that resistance to the neo-liberal assault on collective bargaining rights is something to be fought in the media rather than at the bargaining table or the streets is not unique to teachers. We live, after all, in a world more than ever refracted through media images shaped and framed by the corporate institutions that make them. The late Jean Baudrillard believed the situation had grown so bad that we lived in a world of “simulacra” – that there was no longer any point to talking about reality – and this was twenty years before the internet. The first part of the book, by Molyneux’s own admission, retreads ground largely covered by Chomsky and, more recently, Colin Sparks, though with updated examples from current news coverage and television shows. Whatever differences might exist between news media that lean right and those that lean left, ninety-nine percent of all media are, as Molyneux notes, “pro-capitalist.” This should be obvious in the case of private media, which after all are corporations owned in some cases by even larger corporations, though it might not be not as readily apparent in state-run media agencies like the BBC, which prides itself on its supposed neutrality and boasts of being attacked by both the right and the left. Molyneux also spends some time looking at popular entertainment packaged for and targeted at working-class audiences, such as soap operas, game shows, and reality television, which presents itself as “non-political,” harmless escapism that merely gives the people what they want. The media does, indeed, give people “what they want, though “laced with something else they didn’t want and didn’t bargain for,” which, as Molyneux notes, “is the strategy of the drug dealer.” The logic of capitalism is deeply embedded in game shows and “reality” television, which normalize a view of competition as an inalienable part of human nature despite the fact that for most of human history people have lived in small-scale communities based on cooperation and common interests. In film and televisions dramas, working-class people are dramatically underrepresented, even in shows that presume to depict working-class life, such as the popular British show Eastenders, whose characters are mostly small entrepreneurs. Molyneux ends by tackling the necessary question of how working-class movements should approach their engagement with the media, whose power and reach, he insists, though real, is often overstated (for popular movements and radical critiques have and continue to emerge despite its influence). He also reminds us that media workers are, at the end of the day, workers, and he notes the possibility among them of joining in collective actions “beyond their own pay and conditions,” as in 1972, when British print workers shut down the newspaper operations of Fleet Street in a show of solidarity with local dock workers jailed for picketing. Though the corporate media are irremediably capitalist and, in Molyneux’s view, beyond potential for reform, anti-capitalist movements cannot afford to ignore them and should not surrender the limited spaces available to disrupt them (such as by writing letters, for example). Facebook and Twitter, he suggests cautiously, have their uses, and “are potentially a democratizing force,” though he reminds us that they are corporate-owned companies that have, on occasion, censored their content at the behest of states when it was in their economic interest to do so. Molyneux’s last chapter tries to sketch out what a “media after capitalism” might look like. If social transformation is what you’re aiming for, it’s a good idea to have a sense of where you want to go, though while a certain amount of creative imagining is useful, and probably even necessary, this last section is somewhat underdeveloped, with too many assertions propped up on little more than optimism. Molyneux tells us, for example, that “[t]he structure of socialist society would actively encourage collectivity and democracy and consciously prevent privilege and undemocratic hierarchy,” yet he offers little in the way of support for such a conclusion. Similarly, he suggests that while a certain amount of media censorship would be necessary to contain incitement to counter-revolution, “there would be no need for this to be more than temporary because once the new society is firmly established, especially when it has become international, people advocating a return to the past would be as ineffectual and harmless as people who now want to go back to feudalism and the romance of the Middle Ages.” And when would this be exactly? Moreover, I am not inclined to see as “harmless” the neo-liberal overlords of our world who are currently leading us back to a neo-feudal world order. Still, it is hard to disagree with Molyneux’s conclusion that “[i]f ordinary people were actively involved in making real decisions that affected their lives…this would transform their attitude to politics and therefore to the media.” It’s up to us in the social movements, not the media, to make this happen.